We offer a wide variety of amazing amenities and services to our guests. 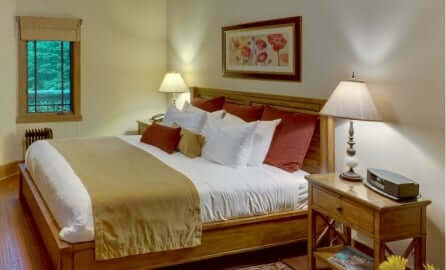 The Esmeralda offers many of the luxuries of 5-star hotels with the charm and character of a bed and breakfast. 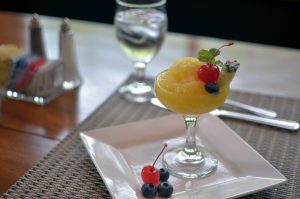 Complimentary hot breakfast served daily to our Inn guests. Our Restaurant serves dinner Tuesday – Saturday 5:00pm – 9:00pm. Wine List and Local Beers are available. 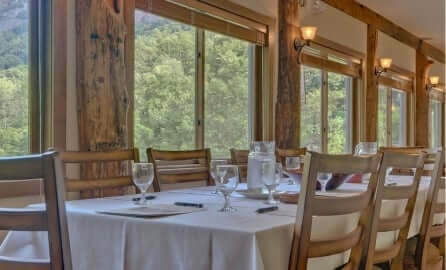 The Esmeralda Restaurant offers both indoor and outdoor seating with beautiful mountain views. Patio dining available in season weather permitting. An endless selection of fun board games. If you’re more interested in relaxing in the common area, there is also a nice quiet reading space for guests to enjoy. 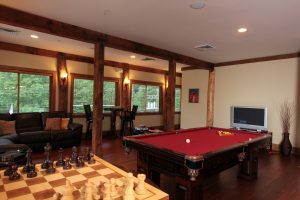 The Patio and Outdoor Spa area – with hot tub, fireplace and stone patio. More than 1800 sq/ft of stone patio, as well as an 15-person, in-ground whirlpool tub. 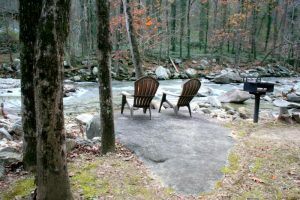 The Esmeralda Park is a scenic dedicated green space for guests to enjoy and relax right by the Rocky Broad River. Only a mile from The Inn, guests can enjoy the serene surroundings of nature while also taking in the picturesque scenery. 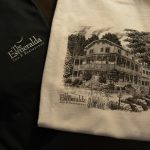 The park includes sitting areas, picnic tables, and hammocks for guests to relax, read, or even picnic by the river while staying at The Esmeralda Inn. 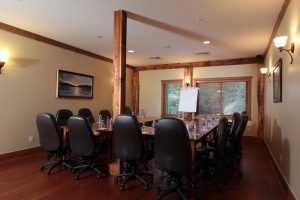 Complimentary high-speed wireless internet access throughout our facility. Elevator. We are the only ADA compliant facility in the area. Bose Wave radio in each guest room. 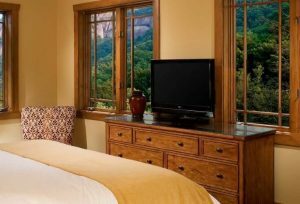 32″ high definition flat screen televisions in each guest room. 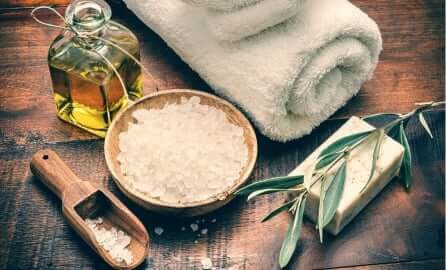 Environmentally friendly Lather brand spa toiletries. Luxurious linens in each guest room. Complimentary bottled waters in rooms. 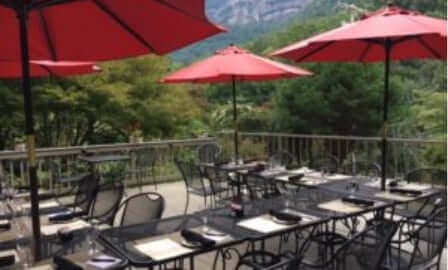 And… easy access to Lake Lure, Asheville and Hendersonville. Are you looking for something different, special, local? We have a nice selection of gift items that are unusual and beautiful! Have a cup of coffee and enjoy a delightful tale of a gentleman’s winter at The Esmeralda! 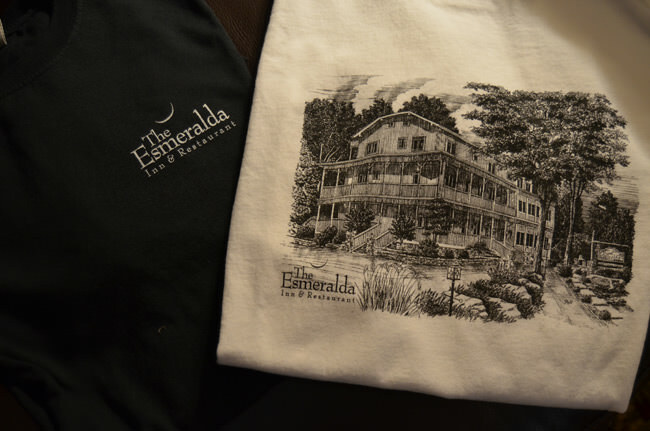 There’s a variety of 100% cotton Esmeralda T-Shirts, bathrobes, Local jewelry & art and coffee mugs for sale in our gift shop.